The Kolewa Foundation is a small charity, founded by Syta Plantinga and located in Bali, Indonesia. Kolewa focuses on helping children and families living in the most poor and isolated areas of Indonesia. Where most children in our western world get a surgery for physical disabilities, cleft lips, open palet and burns, the proper medical facilities, knowledge, hygiene, healthy food etc. are lacking in these areas. Because the areas are poor, underdeveloped and in many cases difficult to reach, there are just a few or no organizations to help. 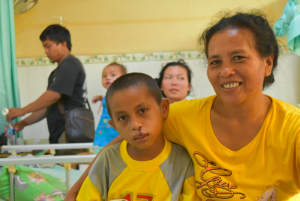 The Kolewa Foundation is always looking for children and families in Indonesia to give them the care they need. To find these children, they scout in the provinces of Bali, Timor, Flores, Rote, Sumba and Sumbawa. After that, the children are transferred from these areas to hospitals in Bali to do research and surgeries. The Kolewa foundations gives them shelter, transportation and is taking care of the costs. When the children received their first aid, Kolewa will look for the right rehabilitation. For example, the children receive speech therapy, have the ability to go to (a special) school, rehabilitate in the shelter of Kolewa and they get much love from all the volunteers and employees. In addition, parents are informed about the best way to stimulate and support their child. Kolewa foundation depends entirely on donations and volunteers. Therefore, they can use all the help. Do you want to support the Kolewa foundation? You can help in a number of ways. You can always like their Facebook page or visit Kolewa during your stay in Bali. In addition, you can become a volunteer, intern or donate to the Kolewa foundation. Kolewa can always use volunteers. You work along with local and temporary volunteers. You can help with the daily activities or you can focus on a particular field. A requirement is that you have to become a volunteer for at least two months. Kolewa regularly offers internships for students of different disciplines including speech therapy, dietetics, physiotherapy and nursing. There is also a need for an intern that focuses on the marketing or the commercial part of the foundation. As an intern you not only supports the shelter of Kolewa but you also have the opportunity to go out to visit the different projects of Kolewa. The minimum intership period is four months. Are you interested in being an intern or volunteer at Kolewa? please contact Care4Needs, Kolewa or Young Professionals Internships (YPI). YPI arranges an internship including accommodation. Another option to help the underprivileged children is to donate because the need for donations remains high. There is a need for small donations from individuals or you can sponsor products or the treatment of a specific child. In addition, there is a need for companies who will contribute monthly to guarantee a certain amount of operations. Do you want more information about what Kolewa does or what you can do to help? Visit the website of Kolewa.